In the last year alone London seems to be catching up with the juicing trend that has been long popular in New York and LA but as they say, don’t follow trends, create your own and this is exactly what Roots & Bulbs in Marylebone is doing. A few months ago I started noticing tweets from Roots & Bulbs and as a consequence went on their blog that made me even more curious ( once curious, always curious ). The opening date kept on being pushed back and so my curiosity only grew but foodie gods answered my prayers & I was given a handsomely sturdy box full of Roots & Bulbs bottles. Now, when I say the word ‘juice’, what comes to mind? Probably a supermarket carton or plastic bottle filled with something too sweet but have you ever asked yourself why does the one you make at home, from scratch, tastes so different? When I opened a bottle of Roots & Bulbs G1 my first thought was ‘wow, I didn’t realise that green juice can be so delicious and refreshing and not sugary at all’ ( most juices are pasteurized, in order for them to stay longer on the shelves but the process depletes the actual juice from nutrition. Remember that next time you are boiling your vegetables ). After downing a few bottles of G1 ( cucumber, celery, spinach, lemon, ginger & spice ), G2 ( cucumber, spinach, romaine, apple & herb ) and G3 ( cucumber, pineapple, kale & herb ) I knew that I have been converted for good. Notice Roots & Bulbs juice fruit/vegetable content ratio and think of it next time you are buying your juice at the supermarket or cafe-that is not to say that fruit is bad for you but juices with a variety of vegetables & possibly one type of fruit carry much more nutritional value in them for your ultimate well-being. Then I tried Roots & Bulbs coconut water and even though it is a little pricier than others on the market, it’s toastiness is beyond delicious and just thinking about it makes me smile. My eldest tried Roots & Bulbs juices ( a close call between G1 & G3) and started creating a stir at the school’s playground, suggesting that his friends try it, while getting some bewildered looks from his friends, as well as their mothers. Roots & Bulbs was dreamed up and put into reality by a dark-haired mermaid called Sarah Cadji. Hailing originally from Greece, where she was raised by a very strong-willed, tough mother, Sarah left Greece after school, graduated from City University ( we have that in common ) and ended up working in finance, in hedge funds. Her work involved lots of business trips to Europe and US and eating on the run, with hardly any nutritional content, or as Sarah more accurately put it ‘I never watched what I ate’. The daily race went on for a while, until one day in 2011 Sarah woke up feeling unwell, so much so that it became a wake-up call. Doctors didn’t offer satisfactory answers or solutions, so Sarah turned to nutrition and started doing a course to become a certified health coach ( it was an intensive year and a half of studies but the pressures were completely different from the financial sector grinder ). When your interest in something is driven by your health it’s never flimsy, so Sarah learnt about every single diet out there and was allowed to form her own opinions on the subject, while listening lectures by top people from Harvard and Yale. While New York and San Francisco have plenty of cold-pressed juice bars ( Sarah was a regular visitor ), London was lacking them ( try finding a juice and something healthy to eat at any train station in London – it’s like an Anneka Rice challenge ), with Starbucks and Costa dominating high streets, so one day a light bulb went up in Sarah’s head and the concept of Roots & Bulbs started taking shape. It took a year and a half to find a location and a further seven months to formalise the designs. Did she expect it to take so long, before the shop opened its doors this spring? Sarah shook her head but there was a wide smile of her face and no regrets about the journey thus far. Sarah tried juicing detoxes and cleanses but that’s not what Roots & Bulbs is about, as Sarah believes that cold-pressed juices should feature in your daily diet alongside food. She drinks a juice with every meal and wouldn’t dream of skipping breakfast. From the beginning that is one of the many things that will endears Roots & Bulbs to you – they are transparent in their approach, they are friendly and they build a dialogue with you when you enter their premises. It was Sarah’s intention to create an approachable brand that wasn’t just about the juicing ( like everything in life, juicing should be done in moderation, as unlike smoothies for example, they don’t contain much fibre that keeps our gut moving ). Alongside juices you have six types of smoothies for now, organic coffees, peanut and almond butters and a selection of freshly made ( the kitchen is right at the back of the shop, you can peak in to see staff, dressed in white lab-like coats and hats, hard at work ) organic meals, which you can now eat outside as well , sitting on a cosy bench ( not your average bench, as nothing is average or predictable when it comes to Roots & Bulbs, including their newly installed fridge which staff ends up polishing endlessly, as younger customers aka children love smearing glass with their fingers, as they decided on the juice selection ) that is particularly comfortable for your bum. Sarah always has a wide, Julia Roberts-like smile, but she became serious when I asked her about building her own business. Unfortunately in our day and age being kind can backfire, as people deem you to be weak and try to take advantage, so it toughens you up and opens your eyes to the realities of the world. While she has a wonderful husband who is her business soundboard, there is another man in Sarah’s life who plays an important role in Roots & Bulbs and his name is Ian Marber, who you most probably know as the Food Doctor ( Ian has built this business from scratch and then sold it when the timing was right, but more about it later ). Ian became interested in nutrition through his own health woes, namely coeliac disease, with which he was diagnosed in 1991. He went from working very successfully in the commercial property investments sector into doing a full-time nutritional course for three years, initially not even mentioning it to his friends. He didn’t have an ambition to go into nutritional food business but as the course progressed, he questioned more and more the fact that no-one was putting nutrition and food into ‘the same box’. Before he finished his course, he put together a book proposal and before long his new career took off: he built Food Doctor, started his own private client practise, travelled the world while giving motivational lectures on diet & nutrition and worked with corporate clients like Tesco & Goldman Sachs. He also took part in TV programmes and shows, as well as have written 12 books, with the 13th one due to be published soon, focussing on the subject of cholesterol. One of the first things that you notice about Ian is how bright-eyes and healthy he looks, with perfect skin and fit body frame. I rarely ask a man for his beauty secrets but I did venture into that territory with Ian – to start with, he is a perfect advocate for the lifestyle that he leads. Saying all that Ian has strong opinions and doesn’t mince his words when asked for his views. Was I apprehensive about meeting him? I would be lying if I said I wasn’t. When Sarah mentioned to me during one of our rendezvous that she was working with Ian, my eyebrows went up. Before long I saw Ian at Roots & Bulbs, talking to staff, tasting smoothies and talking to the customers – it was the first time I saw a famous nutritionist on the shop floor – unassuming, observing and fully absorbed by a conversation. When I later asked Ian how he feels about educating Roots & Bulbs customers, he almost mocked me, saying that it isn’t his place to educate and neither would he ever impose his views on people. His job, as he sees it in the context of Roots & Bulbs, is to answer questions, if a customer wants some clarification or isn’t sure about something. Ian was introduced to Sarah by two people on the same day but wasn’t initially keen on the idea of coming on board: he did like Sarah straight away though. Now Ian is a Roots & Bulbs consultant and the creative process goes along the lines of ‘we have a discussion, agree, talk to the chef, then try to make it happen’. The lead is taken from the customer, who will tell if he or she likes or dislikes something. As Ian says ‘ it’s not about being worthy, it’s about doing the best you can’ with some leeway along the way. Do Ian & Sarah believe in diets? I think the safe answer would be ‘no’, with Ian saying that ‘diets are good for giving you a theme. Nutrition is a bit like finances, if you spend too much, you will might end up in a situation where you can no longer afford to pay your mortgage. Going on a diet is like borrowing money – you still have to give it back at some point’. We also have a very interesting conversation about detoxing. Most people, when they are on a juice detox that lasts longer than a day, complain of feeling tired & grumpy, with headache, general muscle aches and sometimes nausea and when I ask Ian about he shakes his head, stating that it is unnecessary. Think about it – our bodies are very sophisticated machines and were created to work effectively, including the function of getting rid of the things that aren’t good for you. What happens to you when you have let’s say food poisoning? Our kidneys and liver work daily, as does our blood, making sure that our body is functioning s it should. So if you think you need to detox, instead ask yourself a question about what you eat and drink daily that leads you to consider a detox. On the face of it I could have found Ian intimidating, but instead I appreciate his searing honesty and no-holding back rhetoric. He is at a point in time when he is successful enough to pick and choose his projects, he doesn’t have to prove anything to anyone and that makes his attitude to nutrition, as well as life – well, refreshing. Continuing on the subject of nutrition when it comes to Roots & Bulbs, as well as daily life in general, Ian insists that ‘nutrition is relentless and one needs to put things together correctly, with no cutting corners’. When it comes to the whole Roots & Bulbs concept you can see and feel that even though the venture is till very young the thing that drives it forward is the importance placed on the relationship with the customers. It might surprise you but on many occasions that I dropped by to get my juice, smoothies or coffee fix the crowd is different, with the usual fashionable skinny girls dressed and made up to the nines, to men in suits, children and elderly people – some dropping by to just ask a question or two, with a slightly weary look in their eye, and then walking away with the juice in their hand. 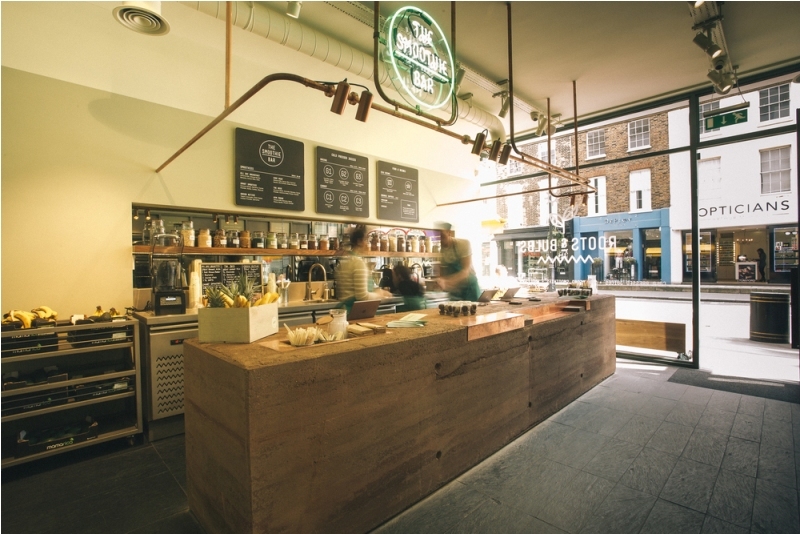 What makes Roots & Bulbs juices different to the ones in the supermarket or other juice bars? Well, they are cold-pressed to start with, a technique that preserves more nutrients through crushing, pulverizing and pressing the juice, so when you look at the left-over pulp it is almost dry to the touch, so the energy of the vegetables and the odd fruit is not lost but actually transferred into the juice that you buy ( when you purchase R & B juices either drink them straight away or keep them in the fridge for up to 48 hours ). So there you have it – a nutritional business where Sarah Cadji is a beautiful headliner and Lady Boss ( try The Boss Smoothie, who knows, some of her wisdom might get transferred to you ) and Ian Marber as a support act – or as I personally call them the Beyonce and Jay-Z of nutrition ( even though Ian is more of an English gentleman with a slightly mischievous undercurrent than an American rapper ). As Ian remarked during our conversation ‘all businesses reflect what goes at the top’ and that’s why when you are next on Marylebone, drop by, you might see both Sarah and Ian talking to customers, explaining, answering questions but never preaching or telling you what to do – according to Ian ‘we are not there to diagnose but we might be asked to dig deeper’.